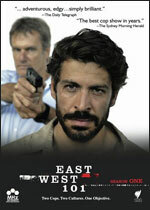 East West 101: Mystery and Suspense on Television. This Australian crime drama is centered on the Major Crime Squad of the metropolitan Sydney police force. Don Hany stars as Zane Malik, a Muslim detective who struggles for the respect of his colleagues. The series aired for three seasons on SBS One in Australia.